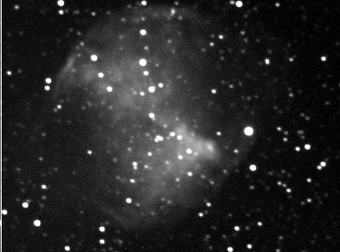 Images are taken with the same instrument - 8" f/6 Newtonian through a 2x tele extender yielding a focal length of 240 cm. The Cookbook Camera worked at double sampling mode and 252 x 242 resolution. May 16 - 1999 - exposure time: 2 x 3 min. Estimated magnitude: 15. August 4 - 1999 - exposure time: 3 x 5 min. Estimated magnitude: 13. The crudely folded light curve for this Mira based on 3 years of R-band photometry with our 1.55-m telescope. The period is around 213 days; I haven't worked at improving the period since there are still some minor tweaks to perform to the photometry. The main things to note are that the variable has a nice, clean, repeatable light curve, and that the range of variation at R (roughly equivalent to unfiltered CCD observations) is about 4 magnitudes. It was first noticed by a Czech amateur astronomer named Leos Ondra. See his homepage at: http://leo.astronomy.cz/ He calls it "Goldilocks' Variable' and says that "though apparent on hundreds of published photographs of M 27 and conspicuous (due to its red color) on amateur CCD images of the planetary, still waits for a good long-term photometry to be officially accepted and named." Believe it or not, Goldilocks' variable was discovered by comparing covers of (May '90) Astronomy and (Autumn '90) Deep Sky." 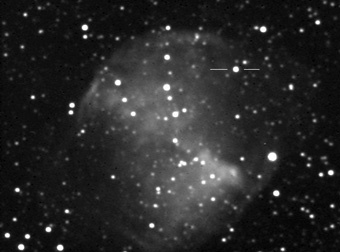 It's apparently suspected to be a long-term "Mira" variable.